I have never made a monochrome card before so it was so much fun to try one out! Don't you just love trying something new? Well go over to the One Stop Craft Challenge and try making your own monochrome card! We would love to see what you create. I used a Robin's Fetish stamp which is a really sweet egg stamp and I added a cute bunny stamp from Mami Doodles. They look perfect together don't you think? Thanks for joining in the fun at DYSU. Love you egg shaped card! This is beautiful! Love that it is not "easter" colors. Fabulous monochrome - beautiful card. Great job! Very, very pretty card. Adorable! Love the non-traditional color! Thanks for playing along at Cupcake Inspirations this week! What a fantastic shaped card, a fabulous image, and really gorgeous colours. Doing a monochromatic color scheme can be a trick, but you pulled it off wonderfully. Thanks for joining us at ABC Design Team Challenge. Fabulous card, very cute. Thanks for joining us at Do You Stack Up. Super sweet card!! Love the egg shape! Thank you so much for joining us this week at The Shabby Tea Room! Great card Dawn! Love the monochrome colors. 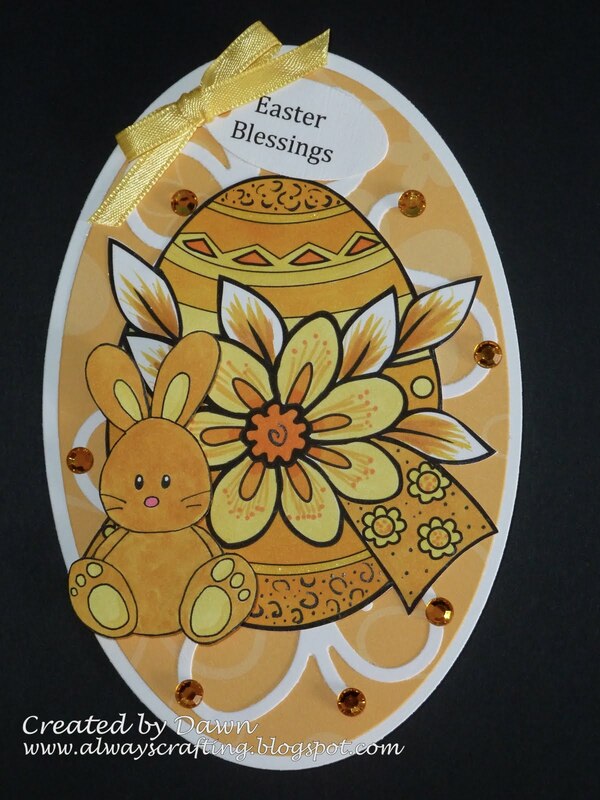 love the colors, special easter card. Thanks for joining the ABC Easter challenge. Beautiful card, Dawn!! Love the egg shape. Thank you so much for playing along with us at Whimsie Doodles this week!! Egg shaped cards have been a favorite with me since I was a child. If this had fluffy stuff I'd really be having a flashback, but the bling is so much better. I love it! What a awesome card. The egg shape card is just wonderful. Very pretty monochrome Easter card Dawn. 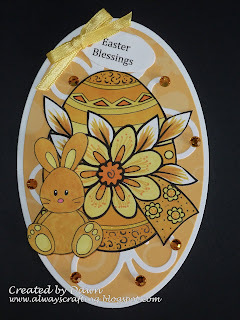 Thanks for playing along at Cardmadfairy's Digi Days Easter challenge. THis is a way cool card. I love it. Thanks for playing along on FOr Fun. Fabulous card. Love the cololour scheme. Love the beautiful shaped card! The images and colors are great! Wow very beautiful!Thanks for joining us at Craft your passions!! Love your monochromatic card! You did a great job! Thanks so much for celebrating Easter & Spring with us at Craft Us Crazy and hope you will join us again! Fabby card and thanks for joining Cardmadfairy's Digi Days Challenge.